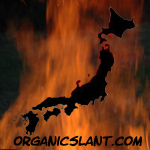 (Organic Slant) Seems like every week, new reports indicate that the nuclear meltdowns at the Fukushima power plant spew new radioactive materials around Japan from fallout and leakage into the environment. The nitemare countinues, Japan is looking more like a hell on earth. According to Singapore-based news outlet AsiaOne, the Tokyo Electric Power Co.(TEPCO), which owns the multi-nuclear reactor power station at Fukushima, announced April 6 that some 120 tons of water that had been contaminated with radioactive substances had leaked from an underground storage facility at the No. 1 atomic power plant site. According to company officials TEPCO estimates that the leaked water contains about 710 billion becquerels of radioactive substances, making it the largest leak of radioactive materials ever at the plant. TEPCO’s handout for the press on April 13, 2013 shows that beta nuclides are being detected in the water taken from either the drains or the leak detection pipes or both in not only the ponds Nos 1, 2, 3 but all seven of these in-the-ground storage ponds. Alerts have been issued on radiation levels in Japanese milk, spinach, leeks and tap water. Food shipments from four prefectures around the Fukushima nuclear power plant have been suspended. Traces of radioactive iodine-131 were discovered in Tokyo tap water on Sunday. In Iiate, a village in Fukushima prefecture, there was so much in the water that the health ministry advised the village’s 3700 residents not to drink it. The water here contained 965 becquerels of radiation per kilogram – treble the “safe” legal level of 300 becquerels per kilogram. Officials have discovered iodine-131 in three milk samples from Kawamata, a town in Fukushima prefecture. A new all-time high radiation level has been detected in a fish near the Fukushima No. 1 nuclear plant. A fat greenling, Hexagrammos otakii, a high-end delicacy in Japanese cuisine, was found to contain radioactive cesium 7,400 times the government’s food safety standard. Tokyo Electric Power Co. said the reading of 740,000 becquerels per kilogram is the highest ever recorded in its sampling surveys of marine life since the March 2011 disaster. The ban on vegetable shipments from Tamura was lifted last month, making it the first in the no-go zone to receive the green light for sales. Monthly 137(Cesium)Cs depositions from March 2011 to April 2012 were reported at monitoring stations within about 250 km from the Fukushima Daiichi NPP. The monthly 137Cs deposition at each station decreased with apparent half-lives of 11–14 d during the period from March to June 2011, and after July 2011 its decrease rates changed. Second peaks of the monthly 137Cs deposition occurred in February–April 2012, which may be supported by resuspension of 137Cs bearing particles. Radioactive cesium levels exceeding 100,000 becquerels per kilogram were measured in mud accumulated at the bottom of swimming pools at two high schools in and around Fukushima city. Recently, large quantities of radioactive materials were released to the atmosphere and coastal waters following a nuclear accident at the Fukushima Dai-ichi nuclear power plant (NPP), which increased 137Cs concentrations in coastal seawater off Fukushima up to eight orders of magnitude above the global fallout background. The measured 137Cs concentrations in surface waters ranged from 1.8mBq L−1 to 3500mBq L−1, up to 3500 times higher than the global fallout background. Radiation continues to flow into the ocean. The contribution of 137Cs, released from the damaged Fukushima NPP to the sea has been remarkable, as it has considerably influenced their concentrations in surface seawater as well as in the water column of the NW Pacific Ocean. Starting from March 15, this video map shows the movement of Iodine-131, a highly radioactive isotope, from Japan’s Fukushima nuclear plant. Japan’s crippled Fukushima No. 1 nuclear power plant halted cooling of a spent fuel pool at the site on April 22 to remove two dead rats, the third time cooling equipment has gone offline in five weeks because of rodents. Plant operator TEPCO said it halted cooling of the No. 2 unit pool, which stores spent uranium fuel rods at the Fukushima site, for a few hours to remove the rats and install a net to stop further such intrusions. Last month, TEPCO lost power to cool fuel rods for 29 hours, an outage it later blamed on a rat that had shorted a temporary switchboard. Radioactive mutations are in play in the Fukushima fallout, and while they’re affecting butterflies now, that doesn’t necessarily mean they’ll stay relegated to the insect world. Study finds ‘abnormalities’ in 52% of second generation offspring from butterflies collected May 2011 — Unusually small wings, premature death. If they’re finding fifty-two percent of these samples showing signs of radiation-induced genetic damage, it doesn’t take much (intelligence) to extrapolate (from these same numbers) what the long-term impact will be on humans. Symptoms of a mysterious disease that has killed scores of seals off the US state of Alaska and infected walruses are now showing up in polar bears. Nine polar bears from the Beaufort Sea region near Barrow were found with patchy hair loss and oozing sores on their skin, similar to conditions found in diseased seals and walruses. Physicians testing for heavy metals in their patients in the U.S. are finding Cesium 134 and 137, which are the signature elements from the Fukushima Daichi plant. When inhaled, plutonium can pass into the bloodstream. Once in the bloodstream, plutonium moves throughout the body and into the bones, liver, or other body organs. Plutonium that reaches body organs generally stays in the body for decades and continues to expose the surrounding tissue to radiation and thus may cause cancer. ANY becquerels can cause harm. Whatever the adult tolerance is (not that ANY radionuclides are good), for children and for fetuses especially, it’s ALL deadly. And 100,000 bq/kg is astronomically over the kill zone for EVERYONE. And there is NO WAY that TEPCO could not know that. This is deliberate mass murder outright. And for what? To save “face”? To save money? Millions will die as a direct result of this. Daiichi IS THE WORST man made disaster the world has ever seen. Toxic radiation is every throughout Japan. The good people of Japan deserve better than to be lied to. Untold generations yet to be born will feel the effects of this snub from TEPCO.